ON 21 February 1908, Charles J Dolan contested the North Leitrim by-election as a Sinn Féin candidate, having resigned his seat as a Nationalist Westminster MP. The campaign office was in Castle Street, Manorhamilton, and the director of elections was Seán Mac Diarmada of Corranmore, Kiltyclogher – later a signatory of the Proclamation of the Republic and executed as one of the leaders of the 1916 Rising. Although defeated by the Nationalist candidate, Francis Meehan, by 3,103 to 1,157 votes, the 1908 by-election laid the foundation for Sinn Féin’s future electoral strategy. As part of the centenary commemoration, the local Mac Diarmada/Gilgunn Sinn Féin Cumann organised an exciting series of weekend events, with something for everyone. All of the events were free. Manorhamilton’s own Seán Mac Diarmada Amateur Boxing Club arranged a boxing tournament for Friday, 10 October. The tournament – organised by coach John Gilligan – featured six bouts with local and visiting male and female boxers who provided a wonderful exhibition. Local Councillor Michael Colreavy presented a commemorative plaque to each of the boxers, with a framed picture of the cumann’s new banner given to the team coaches. On Saturday night, 11 October, the Mac Diarmada/Gilgunn Cumann officially launched their beautiful new banner at a function in the Granary Bar and Restaurant, Manorhamilton. The banner was designed by Mark Mulholland of MM Design Studios of Manorhamilton. Aengus Ó Snodaigh TD performed the official launch. He said the present generation of Leitrim Sinn Féin activists follow a long and noble line of Leitrim republicans. The main events of the weekend were held on Sunday, 12 October: the rededication of a stone originally commissioned in 1968 but which has been in storage for several decades, a wreath-laying ceremony at the monument to Commandant Phil Gilgunn, and the presentation of prizes to winning essays. The commemoration started in glorious weather with the Belfast Martyrs Band and St Mary’s (Derrylin) Pipe Band leading the large assembly through New Line, McDermott Terrace and Main Street, Manorhamilton, past the 1908 election headquarters building on Castle Street to the recreation area opposite the castle. The commemoration was chaired by Councillor Michael Colreavy with Aengus Ó Snodaigh TD, Caoimhghín Ó Caoláin TD and Kiltyclogher’s Jim Dillon sharing the platform. Councillor Colreavy thanked all the local cumann members for their hard work and expressed his appreciation of the support given by local council engineer Gabriel Miney and the council staff in ensuring the site looked so well. In the recreational area an engraved stone originally commissioned by the people of Manorhamilton was rededicated. The stone needed a good deal of restorative work which was completed by noted local sculptor Jackie McKenna. 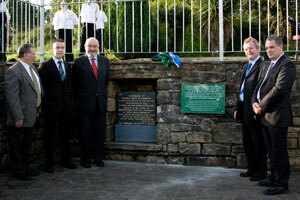 The rededication ceremony was performed by Sinn Féin Dáil leader Caoimhghín Ó Caoláin TD and a special commemorative plaque was unveiled by local Sinn Féin member Seán McSharry. The crowd then marched to the monument of IRA Commandant Phil Gilgunn on New Line where wreaths were laid by Tomás Gilgunn on behalf of the family and by Eugene Gilgunn on behalf of Sinn Féin followed by a rendition of Amhrán na bFhiann. The crowd then adjourned to the Central Bar and Restaurant where the two prize-winning essays in the competition – on the theme “If Seán Mac Diarmada could see North Leitrim and Ireland now” – were read and prizes presented by Caoimhghín Ó Caoláin and Aengus Ó Snodaigh. Adjudicator Proinn Ó Duigneáin spoke of the excellent quality of the essays, with the winning entrants in particular displaying tremendous writing styles, knowledge of history and great imagination. The winner in the Secondary School Competition was Kevin Donohue (age 18), of Doocastle, Ballymote, County Sligo, who attends Sligo Grammar School. The winner in the Primary School Competition was Riona Kivlehan (age 12), of Cullionboy, Kinlough, County Leitrim, who attends Largy National School. Each of the winners received a prize of €150, a writing set, and framed picture of the new cumann banner was presented to all seven entrants. "THE Democratic Programme of the First Dáil declares that the nation’s sovereignty “extends to all the wealth and all the wealth-producing processes within the nation” and “all right to private property must be subordinated to the public right and welfare. We have seen in recent weeks how the greed-based policies of successive Fianna Fáil-led governments left our economy vulnerable to the massive downturn we are now experiencing. We have seen how the greed-based and reckless behaviour of banks and stock-brokers and speculators of all kinds has led to financial meltdown in Ireland and globally. The state had to intervene to limit the damage. But we in Sinn Féin have been long arguing for direct state intervention in the financial sector for many years. We have called for the banks to be reined in, for the exploitation of ordinary citizens to be ended, for the reliance on falsely inflated property prices to be ended and for a state bank to be established. As the Democratic Programme states, the public right and welfare must come first and all wealth must be subject to the sovereignty of the people. That is a principle and an idea whose time has come round again and we in Sinn Féin will stand by that principle and promote that idea. As we mark an historic electoral first for Sinn Féin, we also look forward to the next challenge. I want to pay tribute to our elected representatives at local government level and especially to Leitrim County Councillors Michael Colreavy and Martin Kenny. Next year in this county, and throughout the 26 Counties, we have the opportunity to increase our electoral strength and I urge all republicans to mobilise and work to their utmost to make this a successful election for Sinn Féin. We also have the challenge of the EU Parliament election and the very real possibility of electing a Sinn Féin MEP to represent the West, having come so close in Connacht-Uladh in 2004. It can be done. In conclusion, let us recall that electoral success is vital but is not an end in itself. It brings us another step closer to our ultimate goal. It brings us that much closer to the Ireland for which so many of our comrades gave their lives. The more people we bring with us on the journey the shorter that journey will be".